Matt Denton finally decided making small-scale animatronics for the film industry was too confining and built a giant mantis robot with hydraulic legs. It took him four years and hundreds of thousands of pounds. 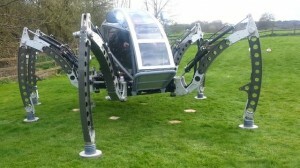 The robot, driver-operated by joysticks within a cockpit, can only travel at 1.5km/h (1mph) and manage a distance of 5km on a 20-litre (4.5-gallon) tank of diesel. “It’s not about miles to the gallon, it’s about gallons to the mile,” he said. Remember that great big mechanical steampunk spider in the movie “Wild Wild West”? This really has to be put into a Doctor Who episode. The late Jon Pertwee, the Third Doctor, loved all sorts of unusual transportation: Bessie, the Whomobile, helicopters, hovercraft, etc. I don’t doubt he would’ve made sure this was used if it had existed in his Doctorate.